It’s that’s time of year again. The 2014 NFL Draft happens May 8-10 in New York City. As usual, the Quarterbacks of the class are the topic of conversation. Is Heisman Trophy winner Johnny Manziel a superstar in waiting or a bust? Blake Bortels and Derek Carr have NFL size and arm strength, but will it project into a starting quarterback in the NFL? Are the SEC quarterbacks, Mettenberger, Murray and McCarron worthy of a 1st or 2nd round pick? Does Eastern Illinois sleeper pick Jimmy Garoppolo sneak into the 1st round? These questions have me thinking about the quality of this quarterback draft class and if any of these guys have what it takes to be the best of the best. We often talk about the “Mt. 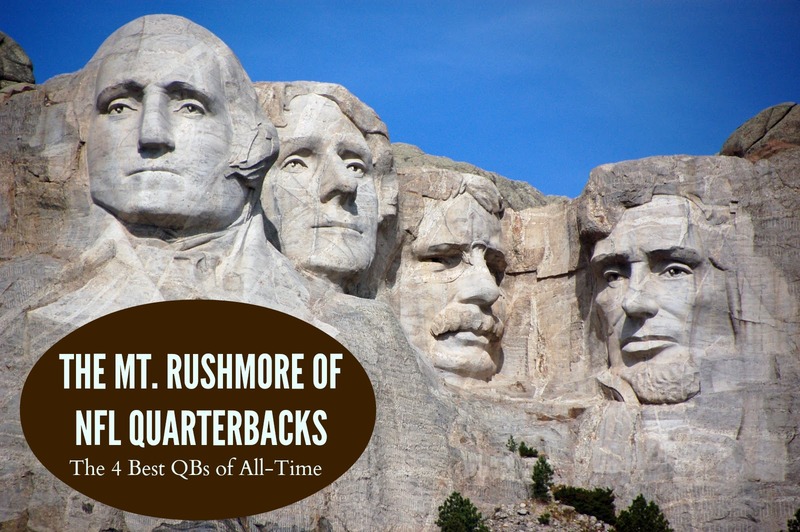 Rushmore” of Quarterbacks around the water cooler. We never have parameters, just hyperbole. I decided to set some parameters and give you my take on who are the four greatest QBs in NFL history and why. Maybe Manziel or Bortels enters this conversation in 10-15 years. Statistics count for approximately 40% of the grade. In today’s pass happy, defense-restrained league, this will give some quarterbacks that are playing in the year 2000 and beyond a leg up on the competition. Specific number of wins and losses do not count. The quarterback impacts the ability to win without a doubt, but a solid quarterback with a bad defense or no running game can’t impact the game significantly enough to overcome those deficiencies in most situations. Championships count in the conversation for 20% of the grade. Our society wants to see winners, but the quarterback has less to do with that than society would like to believe. John Elway has played some incredible football, but he couldn’t do enough to stop some lopsided Super Bowl losses. That doesn’t make him any less of a great quarterback. The theory that a quarterback takes the glory in the wins and the brunt of the defeat in the losses is unreasonable in a game where nearly everyone on the team impacts the game in some way. The Eye Test is highly important. If I was able to see a quarterback play and how he competed, that is going to count for 40% of the grade to get on Mt. Rushmore. I will apologize to fans of Johnny Unitas and Bart Starr, I believe they could be deserving of recognition here, but I didn’t see them play. With these ground rules in mind, let’s build my version of the NFL Quarterback Mt. Rushmore. My friends and I jokingly called him Dirty Dan because it seemed what he did to opposing defenses seemed to be unfair. He was so much better than other quarterbacks. Those amazing completions and escapes in the pocket couldn’t be legal. They had to be some type of “dirty” play. It was just Dan being the incredible player that he was, piling up 61,361 yards, 420 TDs against 252 INTs in 16 seasons. 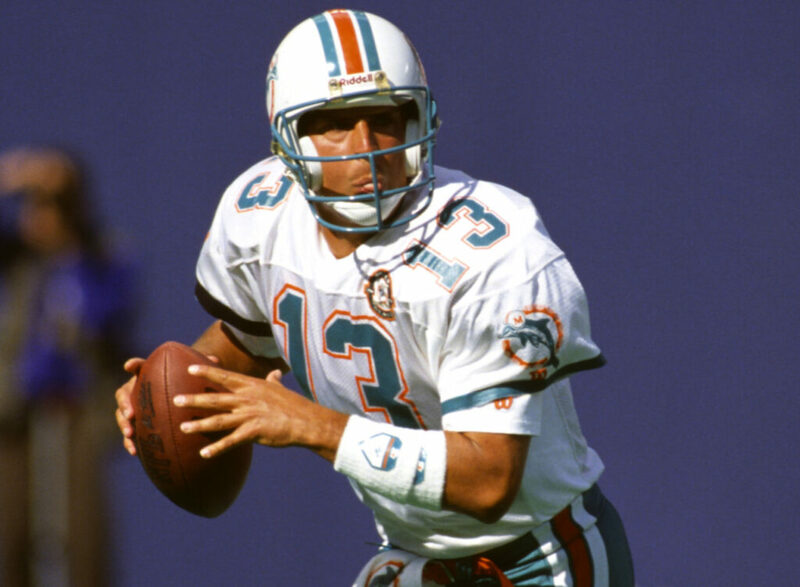 A nine-time pro-bowler and three-time first team all-pro, Dan Marino lead the league in touchdowns and yards when he retired at the end of the 1999 season. Dan accomplished everything a quarterback could accomplish with the lone exception of winning a Super Bowl. This is a bittersweet pick. I’m a Cowboys fan. “The Catch.” Enough said. Montana was probably the most surgical quarterback of his day. During his 15 seasons, he methodically dissected teams in ways I’m sure they still have nightmares about. The comeback against the Bengals in the Super Bowl XXIII was the most talked about drive for years. A three-time All-Pro, eight-time pro bowler, 92 career rating, and the stat people remember most, four-time Super Bowl Champion. Montana was truly a great champion. It’s got to be pretty difficult being Tom Brady. Three-time Super Bowl winner. Five-time AFC Champ. 95 Career QB rating. Two-time first team all-pro and has appeared in nine pro bowls. 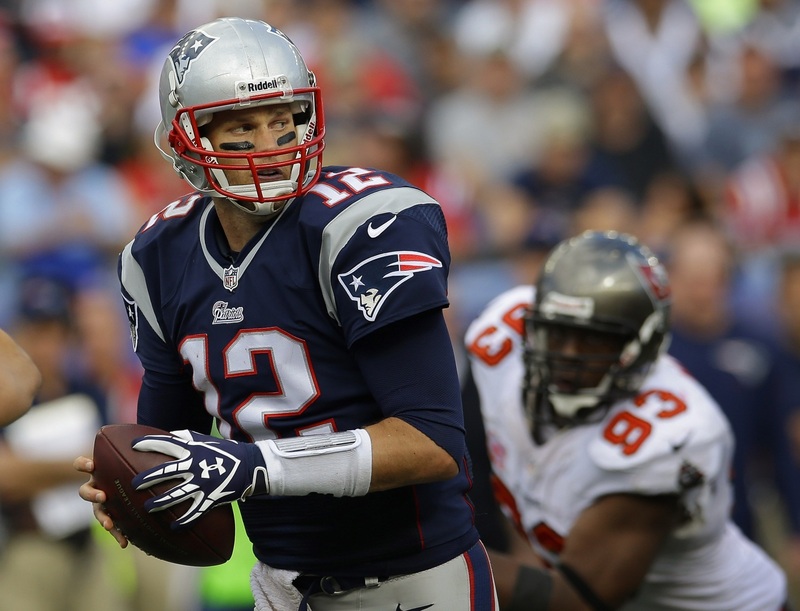 Going into his 15th season in the league, he has 359 TD passes against only 134 INT’s. He owns the record for the second most touchdowns and yards in a single season. He’s the only quarterback of the four in this list who is statistically dominant, wins multiple championships and passes the Eye Test with flying colors. 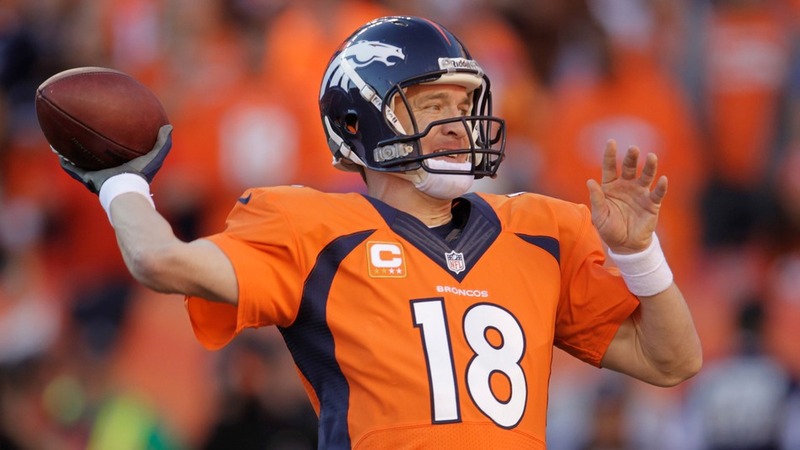 Peyton Manning is easily the most cerebral quarterback to ever play the position. He understands many defensive schemes better than the most defensive players. Manning broke the record for yards and touchdowns this past season at only 37 years old. He has over 8,000 pass attempts and a 97.2 passer rating. He’s a statistical monster and he passes the Eye Test most of the time. My apologies to Brett Favre, Troy Aikman, John Elway, Steve Young, Terry Bradshaw, and Roger Staubach. Although they are great QBs in their own right, they didn’t make the cut time. I’d love to hear your thoughts on my picks. Do you agree with them or would you have chosen differently. 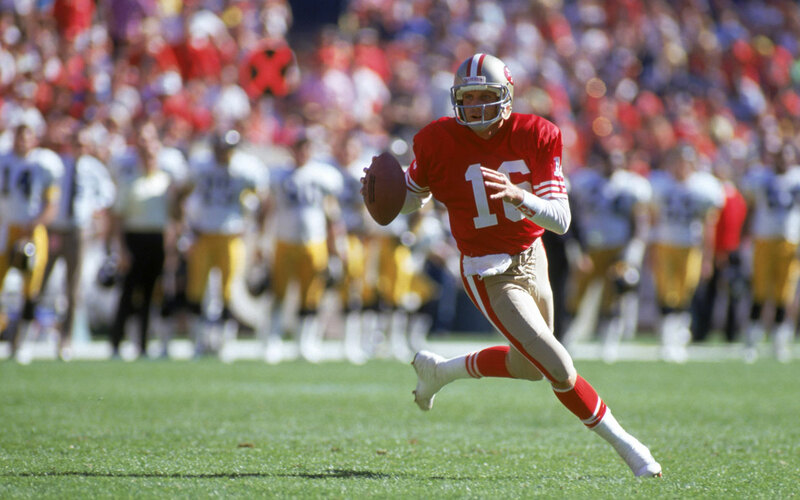 Share your picks for the best quarterbacks of all time in the comments. Relationship Coach and Author of The 9 Tenets of a Successful Relationship. I work with people who want to put in the work to build better relationships.